Saturday Schedule: Practice from 10am (with safety cover on course) Registration from 10am Team runs begin at 2pm Second runs begin at 2:30pm. Sunday Schedule: Registration from 9am Free practice from 9am until 10:30am (with safety cover on course) Official Practice at 10:30am First runs begin at 11:30am Second runs begin at 2pm. Cost: Entry fee for BC members : £5 for div 4/open, £6.50 for div 3. Non-Members can enter by paying a one-time £5 temporary BC membership on top of entry fee. C2’s pay half the standard entry fee. All entries to be sent to address above. 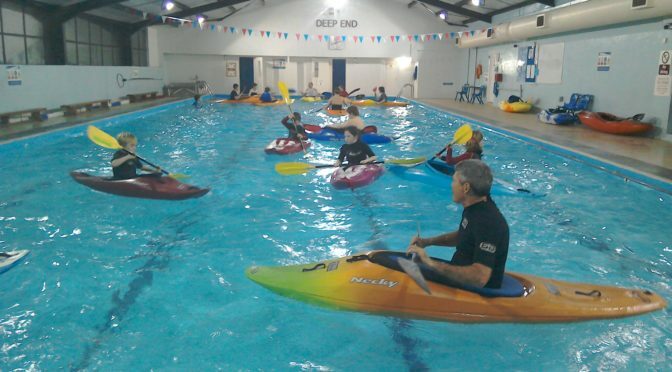 Saturday is a free practice day for all registered paddlers with a fun open team event in the afternoon. We intend to offer coaching to anyone who would like it, please ask at control. Sunday is competition day. 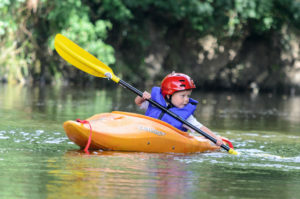 Each paddler will get two timed runs down the river in each class entered (K1, C1 & C2). Please register to get your bib before participating in the practice sessions. Camping is available on site (tents only) at £5 pp for the weekend. nb. The field gets very boggy when wet and is not accessible by car. We highly recommend to wear wellies or walking boots whilst at the slalom site as the the ground can get very boggy when wet. 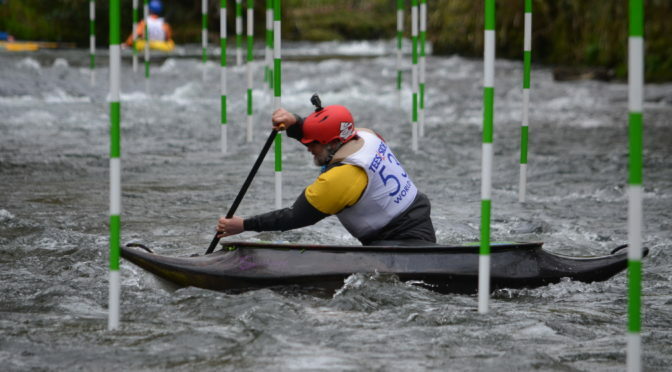 If you would like to have a look at the action from Dulverton Slalom 2016 click here or here. White water, rapids and adrenalin. It was all happening in March in the heart of Exmoor. The third annual Canoe Slalom competition was held on Sunday 12 March on the River Barle at Dulverton. 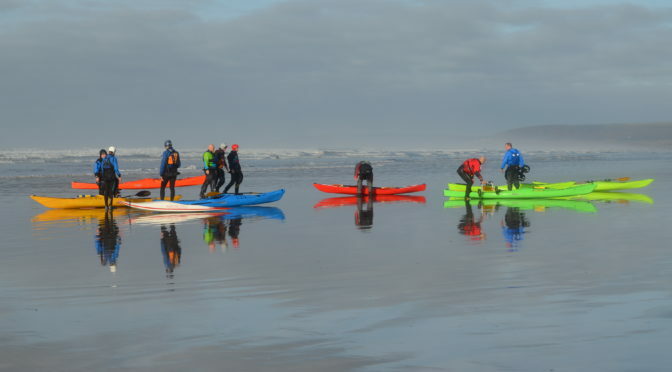 This town is a canoeing honey pot for lovers of moderate white water, with groups coming from all over the south of England and South Wales in the winter in pursuit of excitement and to enjoy the beauty of the valley. 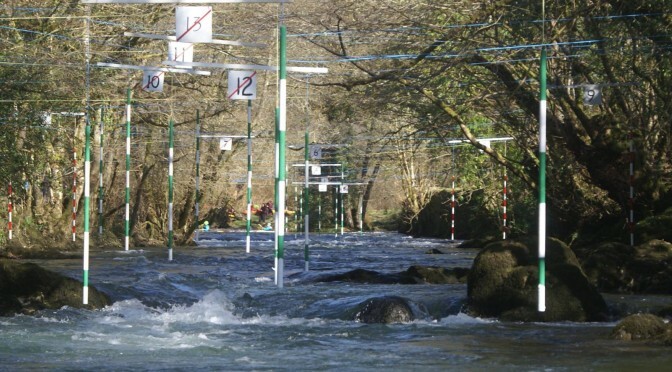 Canoe/kayak slalom is a time trial competition, where competitors negotiate ‘gates’, which are coloured poles suspended above the water. 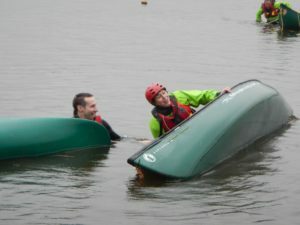 Bideford and Taunton Canoe Clubs jointly organised the event. 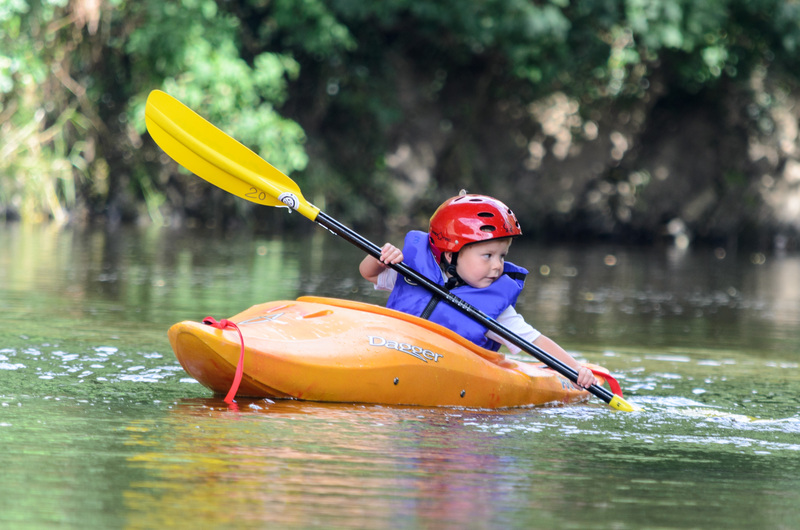 The aim was to awaken more local interest in Slalom, a sport in which Great Britain won gold and silver medals at the 2016 Olympics. This competition had twenty two gates and was aimed at people relatively new to slalom. The stretch of water, locally known as the ‘Camel’s Hump’, is fast and channelled with rocks and eddies, making it a challenging experience for relative beginners. Course designer Doug Smith had set the course to make use of its natural features, with five of the gates taken upstream, using eddies to help people turn into them. On Saturday the course was open for practice and by lunchtime there had been nine swimmers in the chilly river. No injuries though, as the rescue crews were quick and efficient. In the afternoon there was a fun team event, where three paddlers tackle the course together. There were time handicaps for the strongest teams, so competition was fierce, though friendly! ‘Rag Tag and Bobtail’ won the event by just one second from KDS, with Doug/Martin/Kyle not far behind. A total of thirteen teams competed. On Sunday there was an individual competition in several classes. Nearly eighty entries to the competition came from as far away as Salisbury and Monmouth, with ages ranging from 10 years to 78 years. ‘This was our third and biggest slalom competition on this excellent site and we are indebted to the enthusiasm and efforts of all our club members and friends in making it happen. The pay back has been seeing the fantastic excitement among young people in achieving more than they thought possible’. 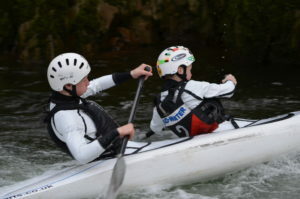 Among the winners, Harvey Merryfield from Taunton CC, aged 15 years, beat all the adult competitors in the Open K1 (kayak single)competition and his brother Thomas, aged 13 years, came seventh in a strong field of fifteen. Course designer Doug Smith from Bideford was a close second to Harvey with Ben Shattock of Taunton CC in third. The brothers went on to beat their dad and his mate in the C2 doubles, where they kneel in the boat and use single paddles. The brothers must have a bright future and are an example to us all! In the Ladies Open K1 event, Lena Kraus of Fowey came first, followed by Molly Knight of Wyedean CC with Katie Shattock of Taunton in third. In K1 mens Division 3, another young talent emerged in Felix Newey from Wyedean CC, aged 13, winning the competition in a field of thirteen. Second place was Jesse Davies from Stroud with Nathan Mower from Bideford in third. In Women’s K1 Div 3, Sophia Stokes of Stroud Valley CC came first with Sennah Nader-Humphries of Croesyceiliog CC in second. Anya Fear of Taunton CC came third. In K1 Men Division 4, Pete Thorn was just ahead of Robin Harris from Taunton. Both were promoted to Division 3. In third place was Caleb Clode from Stroud Valley CC. 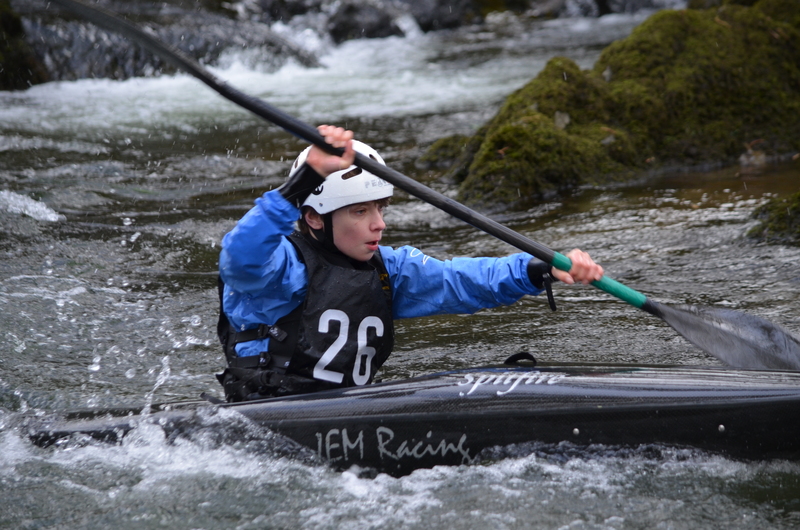 In the K1 Women Division 4 Laura Hau from Seren Dwr came first and was promoted to Division 3. Brogan Swart from Croesyciliog came second and Jenni Denner from Poole Harbour CC came third. In the Open C1 event, where people kneel and paddle with a single paddle, young Harvey beat his younger brother Tom, with club mate Kyle Spooner from Taunton in third. Some of the prizes were donated by Reed Chillcheater of Braunton. Many many thanks to all those Club members who gave up their weekend to get cold, and sometimes wet, in aid of this massive event. Attendance was good, twice last year’s numbers, and most of them young people. Though the oldest was Avis, aged 78! The course was excellent, thanks to our designer Doug Smith, who also provided a complete set of new smart poles. People took on unfamiliar jobs such as judging, which involves lots of concentration and getting numbingly cold. There were many jobs, most of which involved tramping up and down a muddy field. The whole team deserve great credit for sticking with it to the end. Lots of very complimentary comments from people as far away as Llandyssel, Winchester and the Isle of Wight. We gathered a few more new Club members. Thanks also to our new best friends at Taunton CC. They sorted the complex Tutti system of communication and provided hot food and drink all weekend. It was inspiring to see lots of young people on the course, really going for it. The winner of the Open competition was Harvey Merrifield, aged nearly 14. He skinned the field and is a future olympian. His brother Tom, two years younger, is close behind. Other winners in different classes were our own Katherine Smith, and Nathan Mower, who was followed 0.6 second later by Dom Russell, In the Team event the Club gained second place out of 13 teams. Grey hair rules then. Lots of pics and vids on our Facebook page. To all our photographers, please pick half a dozen great shots which we can use for publicity with local papers.